Great turnout for this more intimate session kicked off by Rinaldo Bellomo. He starts by presenting a case of rapid evolving multisystem organ failure following complex cardiac surgery for endocarditis. The patient undergoes a return to theatre due to complications with valve seating where they spend a long period of time of cardiopulmonary bypass. Post-operatively they are ‘relatively well’ despite the insult but are cold (35.5 oC) and coagulopathic. Deterioration occurs whereby filling with 4% albumin solution and vasopressor therapy is initiated with a combination of adrenaline, milrinone and noradrenaline. Lactate climbing beyond 10 mmol/L! A working diagnosis of severe vasoplegic shock with ischaemic hepatitis is postulated. Bellomo asks the audience how to proceed from here sparking some great debate! Is this truly vasoplegic shock or is the patient over-constricted? Do we believe the figures from CO monitoring? Are they accurate? What about RRT to correct the metabolic state? Is there an alternative diagnosis e.g. Gut infarction? What did Bellomo do? Deliver splanchnic ECMO! Closing statement: “Cool stuff, he lived”. Bellomo is due to publish a case series within the next 6 months. Next up, a more typical case for discussion! An obese, hypertensive, diabetic 81 year old patient receiving an elective knee replacement in a private hospital. 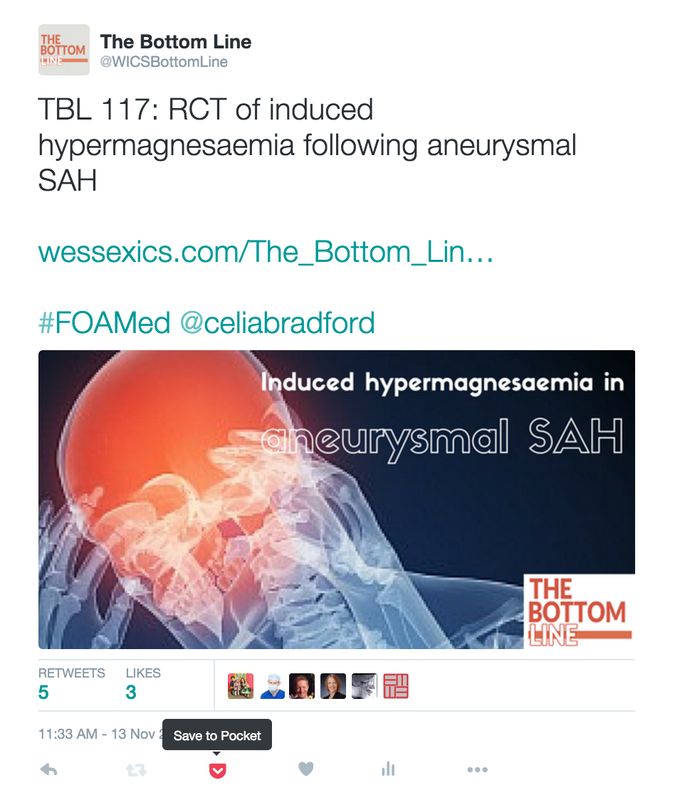 Develops post-operative anuria and hypotension. Blade empty on ward scan by nurse. The orthopaedic surgeon phones a friend, a nephrologist colleague, for advice. Patient receives a urinary catheter and a significant volume of IV fluid over a short period, cue emergency medical admission! Patient hypotensive in pulmonary oedema with AKI. Once again, some great debate! The audience favour NIV and arterial line. Did she really need the knee doing? Furosemide challenge sparked some healthy debate. Barbara Philips asks whether the bolus dose furosemide for overload is the same in AKI as for CKD? Lui Forni tells us that it’s proportional to GFR (needs to be delivered to tubule to work). The audience question the venodilatory effect of frusemide – how useful? Bellomo feels this is modest at best. Audience question: What would you have done if you were called first? Lui Forni: see the patient myself! Audience question: Why renal failure in first place? Superb interaction from the audience: Analgesic infiltration cocktail (containing adrenaline & NSAID) and tourniquet time also postulated as a cause for the renal failure. Patient outcome: Survived. Discharged ICU – day 5. Home – day 10. The International Sepsis Forum Round Table: Mission Accomplished in Sepsis? Disclaimer: The following summary is the author’s understanding of the round table discussion and it is not verbatim transcription of expert’s statement during the discussion. In response to the 3 major sepsis trials (ARISE, PROCESS and PROMISE) with negative results (ie. protocolized sepsis management does not change outcome) in contrast to the findings of Rivers et al in the concept of EGDT, Mervyn Singer raise the question about the plausibility of spending millions of dollars in studies for sepsis to the panel. Daniels: There is a need to engage non-intensivist, including public and GP etc with the help of protocol and guidelines in sepsis recognition and management. We should stick to using sepsis bundle. Bellomo: These comment are “rationale” (Reference to previous talk about medicine is all about rational astrology). We might just not understand what we are doing. If study design is appaling then we have to question the credibility of “evidence” (Referring to Rivers) – At the end of the day, we do what we think is right. Where should we go from here in management of sepsis? Walsh: Proper clinical examination, direct patient assessment is the way to do it. Antibiotic resistance problem: Whats your take? Pickkers: Watch and give it when indicated. Angus: When it is clear – give it! If it is doubtful then use clinical judgement. Bellomo: If patients is in hospital, give antibiotics! Antibitoics rersistance issue contributed by ICM is minute. If RCT doesn’t tell us what we do, then what should we do? Angus: Causal inference – we still need to randomized rather than doing things randomly. Dos Santos: Randomization is still the right way to go. What is sepsis as defined by Science? We need to understand process of sepsis more with phenotypes / genetic level / biotyping. Bellomo: Suggests cluster randomization by hospital. Walsh: Careful selection / randomization of patient with better design eg. don’t compare 80 years old with 20 years old. Daniels: All patients are not equal so treat individually. Could we use more rapid POC test / biomarkers to improve outcome? Walsh: Need more evidence and need more collaboration across the globe. Daniels: It is important to put biomarker result into context. Pickkers: Biomarkers are overrated. Does number means truth? De-escalation – When and how to do it? Bellomo: We tend to overload our patients, why are we doing it? We don’t have the answer. Dos Santos: De-escalation is important during recovery phase in high risk patient group but identification of high risk patient is a challenge. New sepsis definition (Sepsis 3.0 to be published in Feb 2016 in SCCM) – Do we need a new definition? Daniels: It is helpful to have more pragmatic guidance to help assessor recognise and treat sepsis. Pickkers: (Referring to the title of the discussion: Mission Accomplished?) Mission is not at all accomplished. We have no public awareness and we need to put more effort into it. Bellomo: It is a work in progress. A new definition is part of the big process. Haemoglobin – who needs it? What is the impact of transfusion strategy on mortality? RCT – trend to better outcomes with restrictive strategy. Safe & may be better. Hepcidin – is iron of any use to our patients? Critical care anaemia due to Fe deficiency or inflammation induced hepcidin increases? Animal kingdom (evolutionary Hb level, normal/physiological Hb): Is the ‘holy grail’ out there? Following on from an interesting Q +A with Luciano we now get to hear more about the nuts and bolts of managing hypoxia. Intravenous oxygen microparticles – a lifeboat? Patient suffered intracerebral bleed this is not uncommon. Why can’t we just inject O2 into the blood stream? O2 microbubbles have a shell that unzips as gas diffuses out leading to very small micelles when it reaches the lung and thus same viscosity. DOES THIS TRANSFER 02 GAS TO BLOOD? As soon as O2 consumed SpO2 went back down. What about a model of asphyxia? Began infusion of microbubbles or placebo. Next generation is a particle that is stable but can breakdown. Short term support of oxygenation hopefully will become a reality! 5 yr green light pathway 2020 watch this space!!! Can you have too much oxygen? Conservative O2 SaO2 88-95% prob best to avoid hyperoxia. Is there difference in types if cancer eg lung vs bowel? Trauma and stress in ICU: can we make an impact? The session was opened by Dorothy Wade, a health psychologist who has significant experience working with critical care patients. She discussed some of the very important psychological problems experienced by patients both during and after their stay in an intensive care unit. Psychological stress very common after ITU. Often quite severe problems; depression, anxiety, PTSD. It’s a scary place with scary equipment. Often a lot of distress from the surrounding patients – screaming, dying, grieving relatives. Multiple scary interventions – psychoactive drugs. Affects 50-80% – confusion, delusions, hallucinations. Many of these problems can follow patients home – persisting hallucinations and delusions. More common to be in the form of flashbacks. Can affect quality of life; cognitive impairment in 11-62%, psychological distress (anxiety up to 34%), physical impairment. Risk factors fairly well known; benzodiazepines, ventilation, number of procedures. Acute stress the most important predictor of poor psychological outcome. Modify the environment e.g. minimise loud sounds, frightening sights. Avoid psychoactive drugs. Involve families. Helping patients to communicate – find a way. Often not given a high priority and yet this is the part patients really want. Pyschologists should be key members of the ICM MDT – They can do psychology ward rounds (advice on drugs, help keep patients informed), follow up clinic, support staff. However, generally quite poor quality evidence on non-pharmacological interventions. POPPI study and CALMS study are big RCTS investigating interventions – results eagerly awaited. You can hear Dorothy taking to Jonathan Downham, (AKA Critical Care Practitioner) in a pre-conference podcast here. Judith Nelson continued this theme by providing a thought provoking talk on how we should be perhaps changing the areas we are focusing on in our current practice. Perhaps we need to change focus to survivorship, emotion and the team rather than just death, cognition and individuals. There is a difference between survival and complete recovery – surviving ITU affects people. Moving target. Mortality is dropping e.g in sepsis and ARDS. How can we make good prognoses? Note ‘Power and limitations of daily prognostication’ study (ref below) – actually quite bad at this – 50% of those predicted to die left hospital. Magic numbers – we often want numbers that aren’t going to help us – is a probability of survival going to change patient or family attitude? Mean clinician problem – Evidence that being negative or pessimistic affects our patient relationship – viewed as less compassionate. Misplaced emphasis – with increased uncertainty we move more towards value based judgement. We talk a lot about the facts – but we’re often not always set up to manage facts. We have a large amount of hard-wiring that prioritises our emotional response. We need to recognise this in our patients, their families and our self. How do we deal with this? – empathy – try and allow the emotional storm to settle and cognitive ‘rational’ processes to come back to the fore. Jozef Kesecioglu closed the session with a great description of how he was involved in the design of a new ITU. He recapped the history of how the ITU idea had come into being, from the Nightingale wards through to the polio epidemic, noting how their initial focus was in the improvement of physical illness. Main focus of the ITU was the improvement of illness – focus on pathology. We are now increasingly identifying the importance of the patient’s mental health, and indeed that of the staff. So how do we build these factors into building a new ITU? Firstly define a vision – what do you want to achieve? They interviewed patients and families of patients, then created a mock up and actually tested function. Patient centred care dictates design – functionality and safety being defining concepts. Private patient rooms being the standard – many benefits – quiet, infection control, fewer medication errors, improved communication, privacy. Natural light – important for normal biology – day-night cycle. Reduced agitation, depression, analgesia needs. Patient needs to feel at home – chairs, clock. Equipment all behind patient – out of view. Needs of the family also considered – relatives room with internet, TV, phone, own café, outside space. Also 24 hour visiting and beds for family. Actually reduced the concentration of relatives in the unit as not all cramming in during visiting hours. All these changes showed a lot of benefit in satisfaction. Felt it also improved interpersonal features – e.g. staff more helpful, though no change in staff. Some suggestion that the duration of delirium was shorter in the new environment, even if the incidence wasn’t. Some aesthetic factors will age, but the benefits of daylight, privacy and quiet will not. Clearly not feasible to just go and build a new ITU, but the process wasn’t more expensive than it would have been – just more thought put into the design. A great run down this morning of the most interesting papers and guidelines in trauma and sepsis. Links included where able. Cervical spine collar clearance in the obtunded adult blunt trauma patient: a systematic review and practice management guideline from the Eastern Association for the Surgery of Trauma. A must read paper on the Paris terror attacks. Direct and indirect falling in number but more so with direct deaths. Equity of maternity critical care – new and improved! Competencies being developed for doctors and midwives to look after sick obs patients. Extracorporeal carbon dioxide removal (ECCO2R) in respiratory failure: an overview, and where next? What next?? no magic bullet. The discussion is opened by Steve Mathieu’s short presentation followed by Adrian Wong’s. The former states the benefit of social media and FOAM as an adjunct to medical education while the latter reminds the audience of the caveat of learning via social media. Learning is much easier with technology. We have the flexibility of fully embrace, be aware or ignore it. Where can we find the latest infomation? Twitter. Technology makes us lazy – we are reaping the effort of others from FOAM rather than analysing the information with own critical thinking. Who should we follow? Does popular means credibility? Meredith Ringel Morris – Tweeting is Believing? Be professional, critique the source, have a go. The discussion is followed by questions from Anna Batchelor. Should we use Social Media? Mathieu: Remain vigilant and have a critical mindset. Does it change how we work? Downham: Very useful tool to network with the globe. MacSweeney: This is society moving on with time. Mathieu: Don’t know. It reflects male to female ratio of speakers in conferences. Downham: Female are very active as well. Forrest: There is no other way of keeping up to date. MacSweeney: It bring instantaneous update. 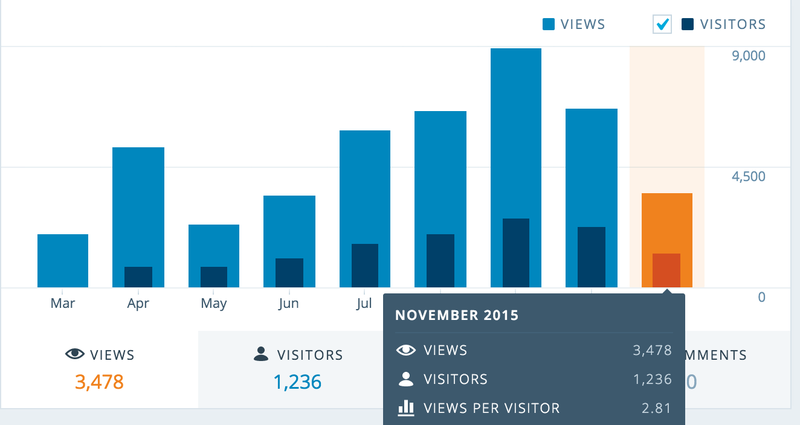 A session blog from Day 1 of State of the Art, London December 2015. See the full list. Standing room only for this talk with many delegates waiting to get in and standing at the back. Luciano clearly a very popular speaker with many keen to hear his views. Charlotte chaired an interesting session aiming to explore Luciano’s gems of knowledge surrounding ARDS. He feels different the use of data can lead to different views. Starting off with an observation of reality deriving a general view which you subsequently try and prove experimentally. Obviously well designed positive trials are very strong BUT If negative be careful to throw away original evidence. It becomes a question of definition. In his own unit LG writes Acute resp failure due to ….because ARDS kills due to underlying disease not due to the ARDS entity itself and defining the ARDS misses the point. Do you use diff nutrition? Not really. Still waiting on better evidence. Which ARDS treatment had greatest impact? TV is the easiest to measure, show and strongest indicator of mechanical power. 6 better than 12, if ARDSNET had done 6 vs 10 would probably not have shown a difference. Should we stop thinking of vent and do ECMO? LG told us an interesting clinical vignette of a young girl from Paris on ECMO overnight who developed a cerebral bleed which she died from. His thoughts are if you can choose between two options be wary of picking the one that can have irreversible complications. Recruitable lung should we take off fluid? Patients getting more obese, aims based on ideal body wt should we change this with super morbid obese? If no recruitment you can avoid higher vols. This is just a summary of Luciano’s Q and A session please see ARDS 3 x 3 for more ARDS info. A session blog from Day 2 of State of the Art, London December 2015. See the full list. The session started with a video of a 73-year-old patient who had been admitted to intensive care following pneumonia. She remained there for 3-4 weeks, receiving a tracheostomy and was obviously very weak by this stage. Events followed her as she underwent strengthening exercises, using various aids as she learnt how to stand and walk again. At one point she was even using a Nintendo wii for exercise. Initial rehabilitation took around 6 weeks before she another 2 weeks in acute rehab before going home. An interesting start to proceedings with a case I am sure we can all relate to. Zudin then came to the stage to begin by outlining what we know about ICU-Acquired Weakness (ICU-AW) and the areas that we are still not clear about. Although ICU mortality is dropping, the rapid rise in admission rates still comes at a cost – Of patients admitted of working age, 50% will not be at work 1 year after discharge, while 30% still need assistance with ADLs (NEJM). The majority of ICU survivors are also classified as sedentary according to the WHO classification. Muscle weakness and wasting is the greatest contributor to this phenomenon – The 2nd greatest complication of ICU admission. Despite its incidence, we still don’t know much about ICU-AW pathophysiology and thus, don’t know the best ways to rehabilitate after weakness develops or how to prevent it. Similarly, the number of publications in the last year on this topic remains small in comparison to ARDS for example. The heterogenicity of the patient population and disease states. The varied patient outcome measures used – Do we need to consider a novel outcome measure? Maybe some patients just can’t be rehabilitated – Up to 40% of patients with multi-organ failure have myofibre necrosis – Maybe there is a biological response preventing its repair. What we do know is that critical illness leads to a breakdown in the balance of protein homeostasis – Reduced synthesis and increased destruction. This has been challenged with the use of neuromuscular electrical stimulation although clinically significant improvements weren’t seen. Studies from the 1970s showed that after 2 hours of being continuously fed, protein uptake by muscles is shut off. Ultimately, it is important to not class ICU-AW as a disease but consider it as a syndrome. The basic science – what do we know? Following that fantastic introduction to the topic, Brijesh came to the stage to tell us in more detail some of the potential pathophysiological features that ICU-AW involves. A combination of CIP/ CIM/ SIM/ SDM. Difficult to illicit one pathway due to the heterogenous group of patients we encounter. It is difficult o reproduce circumstances in animal models. Oliver Friedrich was one of the first to introduce us to the relevant elements of muscle wasting. That the sicker you are, the worse it is. Both acute and long-term states with impact on length of stay. TNF1/p55 receptor – Involved in Apoptosis signalling and drives catabolic action. Upregulation of system driving protein breakdown – Ubiquitin-proteosome complex. Caspase activation involved in diaphragm weakness and muscle dysfunction. There is a Lung-muscle relationship. If the PF ratio bad at 24 hours – more likely to have muscle break down at 10 days. Macrophage infiltrate into muscle – Is this a repair mechanism rather than a driving force? We know that 5 years down line patients still have significant deficit. They are stem cells in muscle itself. Their function changes depending on the age of the patient (young vs old). They may be the difference between regeneration of muscle fibres vs aberrant activation and muscle fibrosis. IGF1 drives this – affected by myostatin in catabolism. Myostatin inhibition already present in nature – you can even get tablets over the internet (see body builders)! Translational research – where are we heading? Lastly Claudia took to the stage having travelled all the way from Toronto to talk to us about some of their current research within this topic. We know that there is an Early and a Late phase to ICU-AW – The Late phase is actually more than 3-6 months after ICU. Atrophy of fast twitch muscle fibres with selective loss of myosin. There is a both a Functional (loss of contractility ability) and Structural (loss of muscle mass) change to muscle tissue. Patients plateau recovery at 6 months – Thus, any potential intervention must be before 6 months, otherwise damage likely to be permanent from then due to the fibrosis. A study looking at the mechanisms that underlie persistent ICU-AW. Aim to better identify those at risk for long term irreversible sequelae and inform elective interventions. Also to identify risk factors for failure of muscle repair/ recovery. They looked at the degree of skeletal muscle atrophy and functional impairment at 7 days and then at 6 months with an associated muscle biopsy. Recruitment proved very difficult, with many lost during follow-up with a reluctance for further invasive procedures shown. Persistent muscle atrophy at 6 months. Mass recovered but contractility remained poor. Sarcomeres looked normal at 6 months vs poor differentiation at 7 days. No persistent defects in mitochondria size or number although their function was not assessed. Genes showed a difference in acute and chronic states. A reduced number of satellite cells may affect recovery. These results help to inform about the potential causes of ICU-AW and will help lead further research into this area. After some fascinating talks, throwing up plenty of areas for more thought, there were plenty of questions taken from the floor and from twitter. What is the practical basis for this information – When should we mobilise our patients and how should we do it? The answer revolved around what your units practice involved, for example did it practice a heavy or light sedation protocol as this will influence when patients can be mobilised. Best practice would suggest mobilising at 48 hours after admission if possible with early physio input. But ultimately we just don’t know what mobilisation is beneficial – it may be the overall package that is relevant. What should the standards be for helping to prevent ICU-AW? The consensus was to minimise sedation and aim to mobilise to a chair for a short period of time by 48 hours after admission. Although we then don’t know if it is the lack of sedation or the early mobilisation that accounts for any improvement – This probably doesn’t matter. Mervyn Singer then asked that even though recovery of many aspects of muscle structure occurs, functional recovery often still does not happen – why? We don’t know what mobilisation does to patient’s biology – until we know this in more detail we can’t work out what treatment will cause improvements. Is weakness an inherent problem we cannot resolve? Is the catabolic response something that is a normal response? Where do we move from normal to abnormal muscle breakdown? How do we know when immune response bad? – We don’t know that yet. Processes that drive repair occur in hours of initial insult – there are mediators, which dampen response for some reason not elucidated yet. Is there a systemic switch, which stops proteolysis and until we know this there is no point focusing on altering muscle processes. How can we detect muscle wasting and what do we do if we have? Detecting ICU-AW is easy – What to do with it is hard. Functional testing is an important feature – sit to stand a powerful predictive tool of likelihood of being independent afterwards. Ensure there is a rehabilitation transition for patients to pass through when discharged from ICU. Chronic critical illness: Prevalent and under-recognised? Multiple evidence of those with prolonged critical illness have poor long term prognosis. Are we converting dead patients into the nearly dead? People with dementia more likely to get pneumonia which then accelerates your dementia. Surviving sepsis often followed by prolonged tail which changes the course of subsequent chronic illness. Chronic critical illness: worse than malignancy? Genomics and metabolomics: which patients get worse? Pick your fights wisely to improve outcome! Should we be more brutally honest with our patients? Don’t be brutal as less is heard. DA we should encourage discussion about realistic trajectory and help patients create meaningful advanced directives. Video of a patient, ‘Bob’. criticalcarerecovery.com – support resource for patients in recovery. Definitions of recovery (revival/healing, reclamation) and rehabilitation (reintegration). Cancer and stroke patients have clear pathways – what about patient leaving ICU? Stressful times around discharge from ICU and hospital. Post intensive Care Syndrome – poor psychological and physical recovery post ICU. Looks at Re-admission to acute hospital – 23% re-admitted within 3 months as emergency, 50% readmitted within 1 year. Why might rehabilitation be ineffective? Patient may not be able to comply. To finish, defining ‘treatment’ and ‘care’ – patients need individualised therapy through case management, not ‘tick box’ care. Patients need individualised therapy through case management, not ‘tick box’ care. Eddy says he has no conflicts of interests, although he also says it’s challenging for him to argue against something he believes works! First – Is it safe/feasible? Bailey et al 2007 Crit Care Med suggests early activity is feasible and safe in respiratory failure patients. Schweickert, Kress et al Lancet 2009 – Early physical occupational therapy in mechanically ventilated, critically ill patients improves outcome. Will everyone benefit? There are some clinical phenotypes and molecular mechanisms that may not be modifiable, or have rehab potential. Can we predict who is at highest risk of developing ICU acquired weakness? Some recent studies suggest Yes. What is the optimal timing? PRaCTICaL and ReCOVER trials look at this. Bed rest single risk factor most consistently associated with muscle weakness throughout longitudinal follow-up. Uses ‘Cliff effect’ to illustrate importance of upstream intervention being more useful to than downstream. When do you start rehab in your ICU? What sedation approach do you use? – Improved since targetting RASS. Pre-existing chronic conditions? Do they not respond or do we need to use different outcome measures? – TW – having thought about this a lot – probably need different expectations with this cohort. More expertise in chronic disease management required. Physiologically speaking, as inferred from animal model, we can endure large lung volume without significantly harmful rise in lung pressure. Lung injury is not determined by single factor such as pressure / volume / flow etc but rather a composite of energy caused but when it is managed in the lower threshold it is relatively safe. The lung rest concept using extracorpeal membrane lung was introduced by Kolobow in 1977 but is associated with high rate of complications such as blood loss and technical issues. However, while patient is on ECMO, the intended low volume ventilation (protective ventilation strategy) allows alveoli collapse which worsened patients’ condition due to atelectasis. The alveoli should instead be “stretched” to maintain opened alveoli. Therefore, it seems counter-intuitive to use low volume ventilation in ARDS (to allow atelectasis) instead of promoting some degree of “pressure” in the lung. Hence, keep the lung “inflated” when ECMO is in use. Well documented uncertainty regarding what lung pressure / MV should be maintained at when ECMO was introduced. Comparing the rise and fall of Hindenburg to the introduction and limitation of ARDS definition – MacSweeney is setting a rather impressive presentation style! Current definition only correlates to 50% of actual pathology of ARDS – it is a flawed criteria and poor definition. Could this relate to the results in hundreds on negative trial? Syndromes are commonly described in critical care medicine. A full room again for these practical interesting talks. What makes a successful ICU? Good outcome data, ICNARC, HCAIs, staff perceptions etc. A personal take on what Portsmouth do. 1000 bed hospital with 670000 population, in financial deficit. A great talk with some excellent hints and tips on how they run a clearly very successful unit. Sounds a great place to work. All med staff, AHPs, med students, nurses etc. Encouraging to learn that Ted is largely impressed by the quality of critical care in England. 67% of critical care units are good or outstanding and come out top of the 8 KLOEs. 100% of Critical care is caring. CQC have seen many examples of exemplary care. Aim of CQC is to change culture and challenge NHS leadership to do better thus avoiding future disasters. What is a small ICU? Is this small ? open to debate. volume outcome relationship is this clearly related? Case studies – Sepsis gone wrong – Have we done enough? Blanket approach therapy is needed before we fully understand sepsis and host response. Value of POC lactate, CRP, PCT especially for primary care. Future aim to reduce mortality. What have we learned from Ebola? Tim Gould opens the session to explain why we couldn’t have much on Ebola last year – the key players were in the field at the time! Following Ebola outbreak, Andy got the call from his boss asking ‘ I’ve got a special job for you’…! The Army devised a programme of prevention and recovery in Sierra Leone. Many healthcare workers (HCWs) were dying of Ebola during the epidemic – 70% mortality of those who contracted the virus. How do you train for something you’ve never seen before? Simulated patient field training exercise. Caring for Critically Ill patients with Ebola virus disease (Fowler RA et al AJRCCM 2014) provided some direction for strategy. A military hangar in York is used as a simulated Ebola treatment centre, with innovations such as gas heaters to simulate 27 degree heat, and fluorescent dye to simulate infective diarrhoea and subsequent decontamination exercise. Sierra Leone is very poor – not just economic but also hygiene, no health infrastructure. The MOD set up a treatment centre with 80 beds carved out of the jungle, potentially 36 beds to treat HCWs. Patients go into an assessment area, screened for fever, myalgia, vomiting. If suspected positive, get moved to a separate area for testing (PCR). If positive, go into confirmed area and treated. If negative, showered, changed and given money from SL government. PPE pre-Ebola was very hot, moisture impermeable, goggles, helmets. New suits for Ebola – lightweight, moisture-permeable, visors, more human looking! Team comprised ICM specialists, ED, Gastro, Resp and GPs. Patients are tested with nasal swab samples – they undergoing portable PCR analysis, 1 hour later – result. Prior to this there was a 72 hour lag time to diagnosis. Fever – 48 hours – D+V – Bleeding / Multi-organ failure. Patients stigmatised if symptomatic so often presented late. The interventions changed over time to reflect increased information about disease. CVC insertion reduced venepuncture requirement. Few needed blood transfusion despite being oozy. POC malaria. Transfusion lab on-site. iStat for electrolytes prompted aggressive K+ replacement which reduced hypokalaemia induced sudden death. The unit used a Flexiseal to contain highly infectious diarrhoea – often patient asked for it! Nutrition was addressed with plumpyNut – a high energy bar, safer and nicer than NG tube. International HCWs infected were repatriated with 1st class care (e.g. Learjet flight home). Public Health England and equivalent bodies requested daily surveillance logs. Is it over? Not quite. DFID have co-ordinated a 16 bed mobile Ebola treatment unit. Huge amount of learning has been achieved and will be disseminated. The German experience. Dominic works in UMC Hamburg which has a treatment centre for highly contagious infectious disease. Impressive spec: 2 airlocks (1 staff, 1 patient). Positive pressure suits, negative pressure unit. Room which has Point of Care testing (ABG, electrolytes, microscope etc). Ebola itself: it’s from the Filoviridae family which has 5 distinct phenotypes. Dominic trots through some pathophysiology. Ebola host is Bats, transmitted by smear infections, poor hygiene, rarely through sexual contact. Dominic outlines Case example of a 35M working at SL with a typical presentation of Ebola. Has MODS (met acidosis, oliguria, hepatic dysfunction). Is this direct virus effect or secondary to hypovolaemic shock? Brincidofivir (17 tablets, impractical), Zmapp (none available), TKM-Ebola (RNA molecule, approved for ‘emergency use’), Reconvalescens-Sera/Blood (requires serum match). ICU shock treatment: Volume replacement (large volume shifts, with oedema ++, electrolyte disturbance) prompted CVC placement which is v challenging requiring rigorous training under BSL-4 conditions. Dominic shows video of clinicians in spacesuits circulating around the patient. In treating patients, there was initially optimism as the numbers got better. However, as has already been talked about in this conference, better numbers do NOT mean better outcomes. Patients after a few days start dropping Hb, rising WCC, suggesting sepsis. Paralytic ileus common. Doing blood cultures not easy (couldn’t get samples to Micro! ), so samples are incubated locally, and checked visually for resistance patterns. Results showed Gram negative organisms, which lead to change of antibiotics from ceph to meropenem. In patients with deteriorating GCS and ileus, unsure how best to manage. In the end they settled for NIV with a gastric tube. Dan runs the Royal Free High level isolation unit. Quote from the press “With no proven treatment for Ebola, care will be limited to Fairly Basic Supportive Treatment” and they will be treated through a plastic bag. This is perhaps underplaying the situation! Royal Free uses a Trexler isolator biocontainment system, with superb specialist nursing care and a MDT approach that provides critical care support but also has access to experimental therapies, some first in man. He has a 100% success rate in the 4 patients treated with Ebola and with no healthcare worker infected. Dan takes us through the 4, now famous patients, including the re-admitted patient with reactivated syndrome. Coppetts Wood was the home of the High Security ID unit for smallpox infection, but never treated a smallpox patient. However they did successfully treat a case of Ebola from a needle-stick injury the Trexler system. There’s also been cases of Lassa fever and Congo fever. He outlines what happens when you refer a patient to his unit. The unit is purpose built for high ID patients, maximum 2 and is a hospital-within-a-hospital. PPE is not used in management as ‘half-suits’ allow interaction with the patient, all contained on the inside. There’s a similar lab to the ones outlined by previous speakers used for point of care testing. Staffing is expensive (Dedicated ICU consultant 24/7, 4 nurses per shift, 2x daily MDT meetings. Again, a CVC placed on admission. All ICU resources (ventilator, invasive lines) available including RRT with its own tent! Finally, how do you prepare for a patient with a highly contagious disease? How do you prepare for a patient with a highly contagious disease? Long term sequalae of Ebola patients? Andy replies it appears that Ebola remains in immunoprivileged sites, not yet reported in the literature. Is there a contigency plan for more than 2 patients in the UK? Dan says that there is a surge plan but if there were more than 8 patients it would be very challenging to accommodate. More facilities coming on stream. Tim Gould asks how Dan manages the agitated patient – it’s a very difficult one, the unit has ready-drawn up meds to sedate if required. Dominic is asked about NIV vs. intubating patient – again the safety of colleagues is paramount and decisions about intubation should only be made if risk of contamination is minimised. He opens by talking about Syphilis – interesting start for an ICU conference! Highlights that syphilis and gonhorrea cause fever. Fever vs outcome in ICU population – high temperature doesn’t relate to worse outcome. Brings the question – is paracetamol beneficial or harmful? So sets up the HEAT trial – Fever + infection – 700 ICU patients are randomised to paracetamol or placebo given every 6 hours. He goes through the trial algorithm for daily surveillance of fever. The 2 groups are checked for baseline characteristics which matched in both groups (treatment vs placebo). The average drop of temperature with patients on paracetamol is between 0.6-0.7C max. (p<0.001) which proves it does reduce temperature. Big question – did patients on paracetamol have a better outcome? Answer- maybe! But…the most striking aspect is that non-survivors spent 4-10 days longer in ICU if they had paracetamol. This was not expected and the importance of the observed difference is unclear. Why did paracetamol behave differently according to whether a patient lived or die? RB then asks the audience, by chucking about a big soft microphone in a box to get audience participation – if they haven’t been concussed. – Paracetamol might have an effect on inflammatory mediation? Perhaps has an anti-inflammatory effect? – Does Paracetamol influence multi-organ failure? – Paracetamol – drops heart rate, resp rate, fever. Perhaps it deludes doctors who think that the patient is getting better. Mark starts by warming up the crowd, highlighting the need of the delegates to participate, not vegetate. He is hoping that people won’t be subjected to a slow death by PowerPoint, with some good examples of poor practice in this zone (blue screen, yellow New Roman font etc). Clip Art, Too much Text, Rubbish quality pictures, Gimmicky transitions, Video that doesn’t work and PCs that let you down. Next is how to present your data in an innovative way. He uses the old failed intubation diagram as an example of how to confuse your stressed user. Prezi and Haiku Deck can help present complex ideas and results if used wisely. Presidents don’t use slides, and Steve Jobs practised his talks to the infinite degree before his big Apple keynotes. Mark cites SMACC as a great example of snappy, well-delivered high quality content in the world of ICU/ED medicine, and John Hinds (RIP) was the consummate professional in this arena. Let’s hope that the speakers have taken note – I can see a few people scurrying away desperately changing their 125 slide presentations! Question from the audience – how does body language help or hinder? Answer – don’t irritate the audience, it’s how you deliver the content of your talk! The number of slides doesn’t matter, it’s how effective the slides are to augment your talk. Final session from John Kheir, a staff physician at Boston Children’s Hospital Heart Center. Lots of ways to try and answer this question, but he quotes Einstein ; ‘Not everything that can be counted counts – not everything that counts can be counted’. As an aside, John has clearly done his homework on presentation – beautiful graphics, clear text and slides. As clinicians, we look at mixed venous saturation, but not O2 consumption. How can we measure the latter, and is it valuable? Perhaps more than lactate /mixed venous sats. Go back to mitochondria – if you deprive it of o2, there’s no current down electron transport train. This causes reduction in oxidation proteins and these can be measured. His group have created a probe which can measure reductive state of mitochondria using a rodent model. He shows a pretty graph showing change in protein expression according to hypoxic or normal environment. Difficult to hear questions as the podium is now surrounded with eager delegates but a great session. Focus Group: RRT seems to pick up dying patients more and triggering end of life decision and palliative care consult rather than what it was intended for, ie identifying ill patient and intervene early to reduce incidence of deterioration. Tan & Delaney CCR 2014 showed that EOL care is commonly delivered during MET calls, and should be emphasised in training for MET members. Aim of Palliative Care – relieve symptoms, exchange information, align plan with values, support caregivers, smooth transitions. Simulated case of patients with metastatic cancer with capacity to express wishes of not wanting invasive treatment presented with acute dyspnoea. Who should we admit to ICU? – ICU causes harm and ICU doesn’t always work! Are we admitting the right patients? Example: CAOS study – Prognostic pessimism in patients with COPD. Question to audience: Have you had any specific training in how to decide who should be admitted to ICU? What influences decision to ICU admission? Question to audience: Do you believe bed availability influences whether or not a patient is admitted to critical care? 18 out of 21 cohort studies showed more chance of refusal to ICU referral when there is limited bed availability. Question to Audience: Does your hospital have guideline on determining whether or not a patient should be admitted to ICU? Audience answer: 62% No, 28% Yes. There is a DOH 1996 guideline for ICU referral decision making flowchart – crude and outdated. Need to be protected from consequences of health care rationing decision. Current work in Conventry & Warwick – Understanding and improving the decision making process surrounding admission to the ICU. To be completed in 2018. Q: How often do you go to assess a patient who has been referred to ICU and think they should have a DNAR order? Ethical implication: Is DNAR decision when indicated just a lottery ? Q: How often do you wish a nice calm conversation had been had with a patient and their family in advance about what they would and wouldn’t want in the event of their deterioration and it was all beautifully documented? Patients rarely initiate discussion, doctors don’t like to have discussions. Recent judgments have made in illegal not to discuss a decision to withhold CPR. While patients can’t demand treatment which will not benefit them but they have the right to know and demand a decision made on them. Discuss goal of patient’s’ care in various aspect rather than only on DNACPR. Jecko Thachil opened the session on bleeding in critical care by providing the perspective of an experienced haematologist. He revisited some of the important physiological basics of haemostasis, noting that it involves the vessel wall, VWBF, platelets and fibrinolysis – i.e. much more than just the coagulation factors. The balance of pro and anti-coagulant factors is complex and often forgotten about. Pt and APTT frequently deranged – 84% PT & 40% APTT tests deranged in one study at his unit – but only a 3 of the 58 patients had bleeding. Coagulation tests (PT and APTT) are pretty simple and tell us very little about the overall haemostatic picture. In critical illness, many clotting factors are deranged and low, but not to the degree that would cause bleeding. Balance of clotting factors can actually be pro-coagulant e.g. increased fibrinogen. Platelets are often an underrated factor in coagulation. Factors in sepsis are often more related to vascular and platelet dysfunction. DIC is a dynamic process – not necessarily based on specific values but changing values – e.g a dropping platelet count more relevant. Therefore, these tests aren’t useful to predict bleeding – they provide a limited picture. Thromboprophylaxis is still important in patients with biochemical abnormality of clotting and should be given in most cases – needs a clinical risk assessment not based purely on PT and APTT. Don’t perform clotting tests unless there is bleeding or dropping platelet count – perhaps controversial. Coagulation test abnormality often not clinically relevant. This opening was followed by an exploration of the challenges with coagulation in a common subset of ITU patients; those with severe liver disease. Suggestion would be that they are at risk of bleeding – actually probably pro-coagulant. Liver disease affects the whole spectrum of coagulant factors – pro and anti. We rarely go looking for the pro-coagulant tests – we look mainly at factors that test for risk of bleeding (mainly just PT and APTT). We therefore have a poor view of the patient’s overall haemostatic state. This means we can see very high INRs, but protein C and S etc. are also very low. TEG/ROTEM is probably better for providing a more balanced picture – not perfect though as doesn’t take into account vascular or VWBF component. Suggestion is that we are moving towards anticoagulation in these patients – there is probably only a small subset of acute liver failure patients who do have the increased bleeding risk. Additional caveat- liver disease patients appear to have an increased incidence of HIT – beware the falling platelet count in these patients. The message is: Treat active bleeding – but prevent thrombosis. The session was wrapped up by David Naumann exploring the latest thoughts on the blood products in the prehospital setting. He started with a description of the changing thoughts on this through history, particularly influenced by the different military conflicts. Opening question: Why bother with prehospital blood products? Blood products better than crystalloid in hospital – so why not bring this out to prehospital arena? Crystalloid restriction is currently en vogue, again why not bring this to the pre-hospital setting? But transfusion is not without its risks e.g. transfusion reactions. Also some big logistical issue – e.g. costs, wastage. But if prehospital blood improves patient outcome, then it should be used for all patient –this needs to be evidence based though. Described a systematic review of the evidence – 28 studies looking at this question – mainly poor quality and only one prospective study. Overall: No mortality benefit, no benefit to early mortality, improvement in shock index – but sicker patients. In general the data is poor and doesn’t really answer question – 28 studies which are heterogeneous and poor quality. However there are 4 RCTS recruiting now to look at this – RePHILL study the UK one. Therefore little to add at this time– we really need to await results of RCTs. AKI: Who will get it? The session started with a great introduction to the problems with AKI from Lui Forni, bringing together a lot of what we know about predicting AKI. The lack of a clear universal definition of AKI is a hindrance. Risk can be stratified according to susceptibility and exposures. Some of these are fairly well know e.g. CKD. We are probably looking at current biomarkers wrong – creatinine useful in CKD but less so in AKI – many impacting factors such as muscle wasting in the ICU. When we think about the aetiology of AKI in ICM, there are so many impacting factors. We should probably abandon the search for the renal troponin. After a brilliant opening session delivering the Gilston Lecture, Rinaldo Bellomo returned to provide a critical look at the impact of AKI on outcome. The key opening question: Do people die of AKI or with AKI? There is evidence of association, but not causation – indeed will we ever find this without randomising people to be given an AKI. Again the multiple different causes of AKI make it difficult to start with a clear biological model. The biological models we do have are very complex. If we do know that is kills you, there is little we can do about it at the moment. Peter Pickkers followed on from these important questions by taking up the point made by Professor Bellamo; what can we actually do about it? Only current therapy is dialysis – support and not a treatment. Again a lot of problems come back to definitions and understanding – can we target minimising initial injury or promoting recovery? Wrapping up the session, John Prowle really emphasised the importance of AKI on the long term health of the patient – this isn’t something that just gets completely better a lot of the time. The mechanism of injury and recovery in AKI is complex and our medical school models describing full recovery are probably inadequate. There is a clear association between AKI and the development of CKD. There are several impacting factors on this e.g. duration of insult, repeat injury. We should be aware that a ‘normal’ creatinine after an ITU stay doesn’t necessarily mean normal function – often significant muscle wasting through their illness. The impact of CKD on morbidity and mortality is significant, we need to be aware of it as a risk following ITU and think about follow up – could this be in the ITU clinic or GP? Summary: How many are we missing? Loads. You can’t drive improvement if you don’t know the size of the problem! Summary: To BEWS or not to BEWS? A solution for previous topic? Problem with prediction scores – If you are well, it is not very discriminatory, if you are very unwell, you don’t need it! Scores are just a crude descriptor of current physiological state, doesn’t predict the following – Mortality, Morbidity, LOS, identify cardiac arrest, anticipated organ failure. Does MEWS mean anything at all? 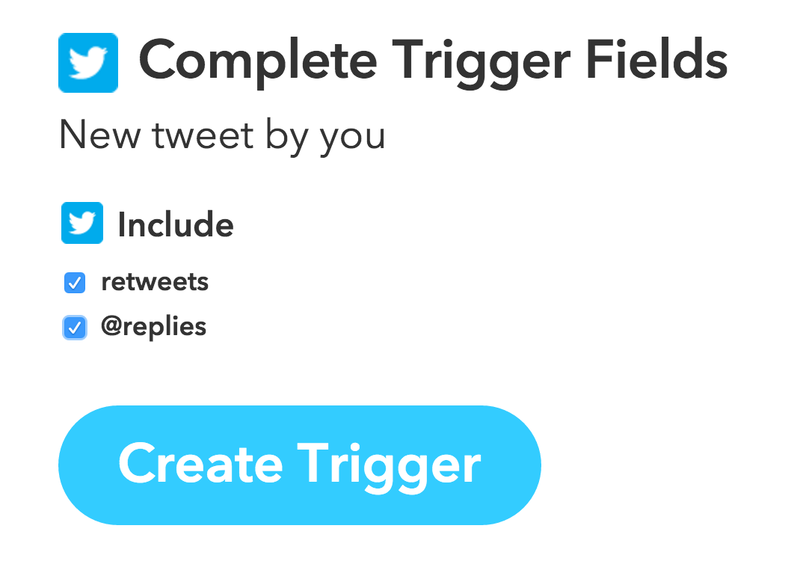 Does it only trigger but does it track? 700 inpatient emergency admissions to critical care. It is a better predictor – So what? Resource allocation – No increased resources but BIPS showed better pick up before patient deteriorate hence resources can be allocated more meaningfully. Change therapy or recognise futility. Dynamic lactate indices as predictor of outcome in critically ill patient. Bigger predictor than refractory hypotension – but why? Belief = lactate is biomarker of tissue hypoxia and anaerobic glycolysis. Lactate level changes with training – but tissue hypoxia is tissue hypoxia, how can training change it? Relatively unchanged lactate level with low PaO2 level in Mount Everest climber. Lactate shuttle between organs and cells as shown in magnetic resonance spectroscopy data in animal model and laser microscopy. Lactate increase in adrenergic state, adrenaline infusion, liver failure, hyperdynamic state WITH NO EVIDENCE OF CO-EXISTING TISSUE HYPOXIA. The reason is that no one can confirm or refute tissue hypoxia – of what? the whole body? the organ? specific cells? Our scientific journey toward real understanding of lactate has only just begun. What have we learned from human factors research? We have known since “critical to success” (the audit commission, 1998) that there is a large variation in performance across UK critical care units. This is due to differences in working patterns, equipment availability or decision making. There are two distinct defined categories of decision making processes, “heuristics or mental models” or “deductive reasoning”. Enterprises such as the surviving sepsis campaign use a bundle approach in an attempt to change our behaviour but one must be cautious as this approach has the potential to crowd out quality at the level of the patient. Specifically, if we focus on process this could be to the detriment of outcome. As clinicians become more senior they develop less confidence with predicting outcomes as they are more aware of uncertainty. Paradoxically they become more confident in their decision making. Dr Brett will be publishing a paper on this shortly. As critical care clinicians we work in an environment that is full of complicated equipment and it is important that we manage this environment so that the technology is not misleading. Critical care is a busy environment, we should ensure that our decision making processes are fluid, transparent and focus on patient outcomes. If simulation is good enough for NASA, it’s good enough for healthcare. Although there is less evidence for in-situ simulation (it is harder to control, and is a lot newer) it is a lot cheaper as there is a significant cost associated with building and maintaining a simulation centre. In-situ sim training has the advantage that you are involving all staff simultaneously, and pertinently the people that you work with on a day-to-day basis in their usual work environment. The realism is also enhanced and people tend to become more immersed in the scenario. Dr Forrest does a lot of in-situ sim training on his ICU. The utility of this training was validated when a fire at his hospital took out both generators plunging the ICU in darkness. The staff did 27 transfers in 3 hours. The feeling among staff was that this was made possible by the staff’s prior exposure to in-situ sim training. In-situ sim training is cost effective, realistic and familiar, and has gained excellent feedback at Dr Forrest’s hospital. Dr Feely feels that in-situ sim training is essential, and indeed they do this at her hospital. However these are short episodes as it would be impractical to do this for a whole morning. Last month she booked 30 in-situ sessions on her unit but was only able to run 6. The advantage of a simulation centre is that it affords a ring-fenced environment. Creation of a sim centre does not have to be expensive and the equipment can of course be taken out for in-situ training. Maintaining safety in large scale in-situ simulation can be challenging as illustrated by the recent terrorist incident drill at a university in Kenya. SIM centres are essential, cost-effective and complement in-situ training. Does the current financial austerity limit what can currently be done? Dr Forrest felt that in-situ sim training is very cost effective. Is there any evidence of impact on patient outcomes? Dr Feely feels that this is very difficult if not impossible to unravel. However the timeliness and the competence of the team is enhanced, along with the positive impact on the resilience of the healthcare staff. A response from the floor pointed out that there is no evidence for any form of education. What is a PFD report? A prevention of future deaths report (Coroners and Justice Act 2009) is produced by the coroner. The aim is to help people focus on system processes that could be improved to help prevent future recurrences of an error. What do you do if you think the coroner got it wrong? Remember that the coroner is only as informed as the evidence that s/he hears. If you attend an inquest be prepared to discuss what you have done or what you are doing. If you want support from the coroner (for example to escalate the highlighted issues to a national level) then please do raise this at the inquest. What happens after the response? Everyone gets a copy of the report, including the Chief Coroner, CQC and family members. After this it often seems that everything goes quiet, but this is the time to ensure that the right changes are implemented to prevent future recurrences. PFD reports should be viewed as an opportunity to improve system processes. The days of the Bolam test are a thing of the past – Montgomery. Recent case of Montgomery(C), a patient under the care of the obstetricians with diabetes. She was told that she was having a larger than usual baby, but not was told about the risk of shoulder dystocia (9-10% in diabetic mothers). Dr McLellan (D) accepted that although this was a high risk she did not consent for this as the risk to the baby was very small. Furthermore she stated that this discussion would not have been in the mothers interests as the patient would then want a caesarian section (which itself has inherent risks). C stated that if she had been told of the risk of a shoulder dystocia she would have requested a caesarean section. C’s labour was complicated by a shoulder dystocia. The end result was a general anaesthetic, a difficult birth and a brachial plexus injury and cerebral palsy. There is now dissent from the Bolam consensus. A patient may well have in mind circumstances, objectives and values which s/he may not make known to the doctor but which may lead him/her to a different decision than that made by a purely medical opinion. The doctor has a duty to warn his/her patients of the risks inherent in the treatment that he/she is proposing and especially so if the treatment be surgery. The law post-Montgomery has changed! Discussing risk shouldn’t be limited to a numbers game, it should be part of a two-way dialogue. The Mental Capacity Act was released in 2005, includes a “test” to assess capacity. Section 5 of the act allows you to provide treatments for patients that lack capacity as long as it is in their best interests. Section 6 of the act allows you to restrain the patient for the above purposes as long as it is proportional and in their best interests. Some treatment decisions are more serious, and should go to the Court of Protection. Deprivation of Liberty (DoL) relates to the ability of the patient to have the capacity to make decisions regarding the residence and care. The recent case of Cheshire West established the elements for DoL – is the individual under continuous supervision and control, and is the person free to leave? The capacity (or lack thereof) of the patient is irrelevant to the above “acid test”, as is the reason for the placement (a gilded cage is still a cage). This is more relevant to people in the community which is the setting of the above judgement. For hospital settings, the Law Society issued some recent guidance. This is worth a read – chapter 4 of the Law Society Guidance (Deprivation of Liberty – A practical guidance, April 2015). We should continue to treat our patients according to the guidance of the MCA as long as we are acting in their best interests. The recent uncertainties surrounding the relevance of DoL to our patients is starting to become clearer. RCTs and Big Data – future fusion? The problem with “thick data” (highly granular, small number trial data) is that we’re often left in a “data-poor, opinion-rich” environment once an intervention has been approved, given the RCTs providing this information don’t generally reflect real practice. On the other hand “big data” analytics allows inferences about optimal care and allow for real-time informatics (essentially forming a “just in time” cohort study to influence patient care there and then), but don’t allow researchers to assign causality without the benefit of randomisation as they’re purely observational studies (Longhurst 2014). Two models have tried to build on this: Point of Care (POC) clinical trials, where an EHR is used to alerts to patients which can be recruited, but still lack the large scale of big data analytics and retains the problem that recruited patients are in effect guinea pigs; and platform trials which are essentially adaptive RTCs, using techniques such as response-adaptive randomisation where the current statistical model is used to change randomisation odds – or even lead to the introduction of new arms of the trial on the fly – to ensure that the patient being recruited gets the best available treatment based on the best available evidence. Again however platform trials are limited by small samples, a poor understanding of methodology and reporting, and tend to be focussed in the pre-approval setting. REMAP (randomised embedded multifactorial adaptive platform trials) try to blend POC and platform trials to provide the same benefits of big data analytics while retaining the ability to make causal inferences – an example being the REMAP Severe Pneumonia program (Angus 2015). Angus. Fusing Randomized Trials With Big Data The Key to Self-learning Health Care Systems? JAMA. 2015;314(8):767-768. Selection bias: n may equal ”all”, but how did the the patients appear in the dataset to begin with? There’s an implied bias in critical care datasets, i.e. these patients must be sick but potentially salvageable; this effect can modify or distort any association and limits its applicability to patients from outside this patient group (e.g. potential referrals to ICU on the wards). A further concern in using big data lies in interpretation of dynamic systems, where pre-hoc results then influence the post-hoc estimates. This is a risk in both thick data (see the run up to the Scottish referendum) and big data e.g. Google flu trends (Lazer 2014). The major strength of big data comes from where it is combined alongside thick data to give robust generalisation to causation, but users of the data must be aware of potential biases brought about through the seductive n = all. Freemantle et al. Increased mortality associated with weekend hospital admission: a case for expanded seven day services? BMJ. 2015 Sep 5;351:h4596. We face a significant problem with public acceptability and trust in big data analysis. This may be due to generalised erosion of trust in data, science, and large scale programmes as a whole; however it is probably less significant than we think as researchers (as highlighted in the Q&A regarding the difference between public perception of health big data and surveillance big data). “Public engagement” is likely to be a major contributor to solve this, but takes many different types and approaches to achieve a number of different outcomes (Aitken 2010). On the whole we still face a deficit of public trust in the use of big data in healthcare (see the problems implanting and benefiting from care.data); we need to rebuild this trust with transparency and a well thought out, on-going, dynamic public engagement programme. MIMIC is a “medical information mart” composed of ICU physiological and clinical data, hospital data, and post-discharge data. This allows observational studies to be performed on a huge number of patients. Leo once again noted that causation can never be proved by an observational study, but highlighted that we can often be “selective purists”: the causations between smoking and cancer or CO2 emissions and climate change are widely accepted despite the lack of RCT; yet we’re prepared to slate observations of a link between vaccines and autism! Multiple studies have shown a significant correlation between the outcomes of RCTs and observational studies in the wider healthcare context (Ioannidis 2001), Cochrane setting (Anglemyer 2014), and the critical care literature (Kitsios). As we also suffer from the problem that there are too many questions in intensive care to perform a RCT for each one (even if it that was possible, which it isn’t always), big data has the opportunity to provide high quality evidence in these cases, so long as we are aware that it is still observational data. MIMIC is a huge dataset, but still suffers from limitations. As a single centre database the results could argue to be of limited value, as they may not be generalizable to other datasets; MIMIC 3 aims to address this in collecting data from multiple international centres. The researchers also faced barriers to data sharing and transparent peer review, and it was noted that there is a divide in practice between how data scientists and clinicians used the data: There is a large body of machine learning literature showcasing optimisation of diagnostic algorithms based on big data, but it isn’t always clear what these mean in the real world to a patient on ICU (Wagstaff 2012). The outcomes from the MIMIC studies are more than just the data, although this is freely available for analysis. This includes their “lab notebook” of techniques and search strategies used, and the software to allow sharing of information and replication of results. This highlights the key takehome message: The value of big data doesn’t just come from its results, but hinges on the ability to share the data, methodologies, and finding. Anglemyer et al. Healthcare outcomes assessed with observational study designs compared with those assessed in randomized trials.Cochrane Database Syst Rev. 2014 Apr 29;4:MR000034. Kitsios et al. Can We Trust Observational Studies Using Propensity Scores in the Critical Care Literature? A Systematic Comparison With Randomized Clinical Trials. Crit Care Med. 2015 Sep;43(9):1870-9. How can aspiring researchers develop the core skills needed to work with big data? There are multiple courses in epidemiology in universities across the UK; you need a grounding in the fundamentals of observational studies, then arrange collaboration with engineers and statisticians for data analysis (such as at the FARR Institute). The most difficult part part is finding time and funding for an OOPE. Why are we happy for medical research groups to use our data, but not for example government surveillance services to use our data? This comes down to the interest of individual verses the interests of the public, and how this impacts on the eight ethical elements discussed by Sarah. The panel also thought there may be a generational component to this – are the younger generation happier with their data being “owned” (e.g. Google and Facebook), or are they more aware of the hazards? How can we tie this in with randomisation to provide solid information regarding causation? The key in doing any big data research is to randomise where you can in advance to avoid confounders. An example of this would be government or health policies; randomise then assess the impact, rather than universally enforce and perform a retrospective observational review. There are limitations to this (you can’t randomise where a weekend falls), but this means reframing the question: learn what you can from the observational study, but rather than a knee-jerk response and blanket implementation of a single policy trial multiple different and randomised responses to the problem, and compare these prospectively. Point of care Ultrasound: fad, future or current standard of care? A Pro/Con Debate on the topic of Echocardiography and Lung Ultrasound on the Intensive Care Unit. If you have any thoughts on this area, we would love to hear from you. Both were proponents on the use of echocardiography and hence the presentation and the discussion that followed addressed several issues surrounding the use of Echocardiography on the ICU. A straw-poll of delegates in the room showed that the vast majority worked in ICUs which had Intensivist-performed echocardiography. Echocardiography on ICU is a challenge because the patients are challenging. Cardiologist are not necessarily comfortable with scanning ICU patients (this will change) and Focused-examination by Intensivists may not be sufficient. Training in echocardiography is crucial as it is an essential skill on the ICU. Misdiagnosis can expose the patient to significant harm. TransOesophageal Echocardiography for haemodynamic monitoring (and diagnosis) may be coming to a general ICU near you. Once again, training is the key issue. Pro-Con 2) Lung ultrasound: why not just get a CXR? A David vs Goliath battle with Ashley gamely facing off with the man who is THE giant in the field (he wrote the books, papers, lectures etc…..). Although the delegates in the packed room where convinced that Lung US had a place on the ICU, only 4 would consider themselves ‘experts’. The rest were ‘dabblers’. There is little doubt that lung US is a useful tool. BUT like echocardiography, the key issue discussed surrounded training. There was simply not enough trainers at the moment to meet demand. It took Daniel 26 years to master lung ultrasound! The ICS’ CUSIC accreditation believes that it can be achieved within 6 months in the right training environment. Given this situation, it may be awhile yet before Lung Ultrasound replaces the humble chest radiograph. THE take home message from all 4 members of the panel – ALWAYS START WITH THE PATIENT. Ultrasound does not replace the need to take a good history and examining the patient. As part of the buildup to #ICSSOA2015, the inaugural ICS CUSIC course was held over the weekend of the 5th and 6th of December 2015. Faculty comprised of colleagues experienced in the skills of echocardiography and point-of-care ultrasound. The course programme aimed to cover aspects of both the ICS FICE and CUSIC accreditation syllabus. Over 33 colleagues from as far away as India and Gibraltar benefitted from lectures as well as valuable hands on experience using the latest Sonosite X-porte machines. In the spirit of FOAMed, @justinkb ‘s brilliant talk on Lung Ultrasound was broadcast live on Periscope. Over 100 people from across the globe tuned in. If you’ve missed it, you can catch it again here…..
Watch out for more ultrasound goodness over the duration of the conference. 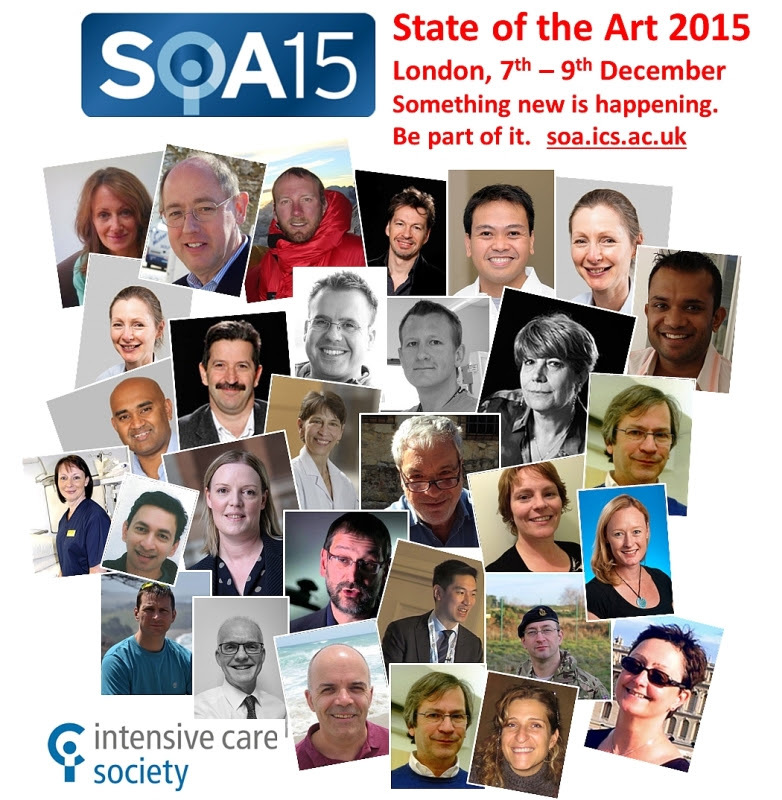 Join in the conversation at #ICSSOA2015. The full final programme for State of the Art 2015 is here – you will not have seen this version before, so please take a look: it’s very pretty, and has some extra details. If you’re sold on it, registration is here. We’ve frozen rates until Dec 4th, or you can pay on the day. Whether you’re coming or not, please take a look and send us your wishlist for SOA 2016 and 2017 (we’ve already started planning): it’s your conference, above all. You can email thoughts to info@ics.ac.uk, or my personal email and Twitter handle are below. We’ve added some interval pop-up sessions on a soapbox in the exhibit halls, for added interest. There is one on the lung (including the PHARLAP study, for those interested), one on global healthcare, and on Tuesday the end of life / ICU decision-making session will break out into a podium discussion in the main hall. Keep an eye out for them, and join in. And we have spare stage space, so if you fancy taking on a speaker of your choice, make us a pitch and we’ll mic you up. For our opening plenary Sepsis Panel, you can email or Tweet your questions in advance, to the massed minds of Derek Angus, Rinaldo Bellomo, Ron Daniels, Claudia Dos Santos, Peter Pickkers, and Tim Walsh, with Mervyn Singer chairing. Email to info@ics.ac.uk, and Tweet using #asksepsis or directly to moderator Jamie Strachan at @strachanjamie. You can see and add to what others are asking here: and http://twitter.com/#asksepsis (no login required to view). The session will be fully downloadable (audio), so if your question is picked you can send your mother the MP3 and make her proud. Transport for London are offering free travel on Monday 7th December to anyone who has a Mastercard linked to their Apple Pay. If you don’t know what this means, it’s probably not for you. When you arrive, remember to stay on the DLR to Prince Regent, otherwise you will have to walk all the way from the wrong end of ExCeL, which is about a hundred miles long. Conferences are meant to be fun, so you will be required to enjoy the evenings. Clear and firm instructions on how to do this are being drafted as we speak. Failure is not an option. Registrations for State of the Art 2015 are at a record high, with nearly 800 of you already signed up – this is higher than at this stage in any previous year. It promises to be a vibrant meeting and we are looking forward to seeing you. For medical staff of all grades, we appreciate that the proposed second day of industrial action on 8th December may be causing some uncertainty over Trust planning and study leave, not least as it is unclear which way things will go after 1st December. For this reason, we have extended the standard registration fee deadline until midnight on Friday 4th December, and will keep the conference fees at current levels until then. We hope this will avoid any financial penalty if you need to wait before registering. For simplicity and parity, we will apply the same arrangements for nursing and AHP registrations. Please note the online booking system will close on Monday 30th November, but you will be able to register at the same delegate rates by telephone (website will be updated with details). For junior doctors who already have approved leave and are wondering about the BMA view, new FAQs are due out from them soon but our understanding from Mark Porter is that if you have booked external professional or study leave, the BMA supports you attending planned educational events, and would not expect you to participate in industrial action. You will need to inform your employer as normal. We have been in contact with our speakers and are planning to run the full programme with minimal substitutions. We look forward to seeing you at the meeting. With only a couple of weeks to go, a few thoughts in the run-up. Standard registration closes on Monday 23rd, after which the late registration fee kicks in. I am a habitual offender when it comes to being late for this sort of thing, but I find it makes both your spouse and your accountant very angry when the bank statement comes in. Register now, and save yourself some earache. Industrial action: the second proposed strike date is on Tuesday Dec 8th, which is the date of most of our oral presentations and many other trainee-focussed sessions. Mark Porter has confirmed by email to Stephen Brett within the last 24 hours that doctors on study leave are not expected to take part in industrial action (this is distinct from local educational activities within job plans). The BMA’s 2012 FAQs state “Where industrial action takes place during a member’s study/professional leave, the employer can be expected to treat them as on leave and not participating in the action”. Mark tells us that updated FAQs will be out shortly, but we do not expect major changes to this element. The ICS response to the strike vote is here. The latest version of the programme is on the website (check out the PDF for latest adjustments), and is looking pretty good – if we do say ourselves. The speakers have been reminded on your behalf to focus on the current and future clinical relevance of their subjects (and to be prepared to disclose their own actual practice, where the data is equivocal). You will able to quiz them by microphone and Twitter in every session, and to learn from the sessions you miss as well as those you attend through rapid access to slides and audio recordings. Our opening plenary features our very own ‘Sepsis Six’ of Derek Angus, Rinaldo Bellomo, Ron Daniels, Claudia Dos Santos, Peter Pickkers, and Tim Walsh, chaired by the inimitable Mervyn Singer. They are there for you to put them on the spot. Do campaigns, bundles, and Government-mandated guidelines actually work? (one for Ron and Peter). What about antibiotic resistance? Is there any point still talking about sepsis, when we can’t seem to get positive trial results, or should we just give up and stick to the basics? Come along, bring your inner cynic, and ask the sort of questions you can’t send in to a journal. In a new twist, we’ll also be taking questions for the sepsis panel in advance. In fact we had the idea long before Jeremy Corbyn and his new-style PMQs (although we did steal it from Question Time). Tweet us questions now, using #asksepsis as a tag. You will also be able to email them to info@ics.ac.uk. Selected questions will be attributed, if you would like us to (include your name if so). If medical social media is a closed book to you, another of our plenary sessions will aim to show you what it’s about. How do you keep on top of the vast array of published information? Have you wondered how your juniors seem more clued up than you on some topics? Do you know where to go online for headlines, thoughtful interpretation, discussion? Or is it all a waste of time? Come and find out, from Anna Batchelor, Jonathan Downham, Mark Forrest, Rob Mac Sweeney, Steve Mathieu, Steve Webb and Adrian Wong. One of them is FICM Dean, several of them run leading educational websites, and one of them will be in a bow tie. Come along, and figure out which one is which. Critical care ultrasound is evolving. Previously the remit of enthusiasts, the use of ultrasound has become an invaluable tool which has the ability to guide clinical management. The Focused Intensive Care Echocardiography (FICE) accreditation is now an established programme which allows clinicians to attain the skills and competencies required in a critical care setting. 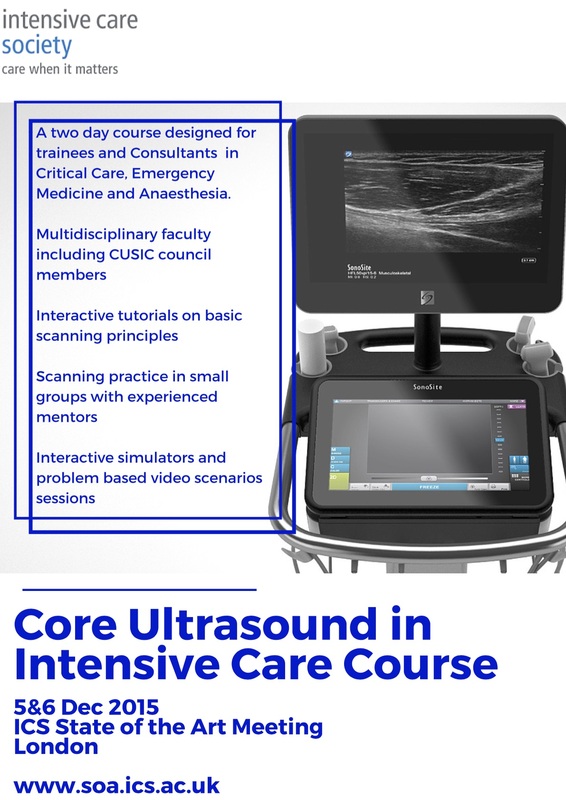 The Core Ultrasound Skills in Intensive Care (CUSIC) accreditation is designed to be an extension of this to modules involving lung, abdominal and vascular imaging. Run by faculty comprising members of the ICS CUSIC Accreditation board, this 2-day course (5th and 6th Dec) maximises hands-on practical experience in small groups and is suitable for colleagues in acute specialties. It will cover all aspects of FICE and CUSIC. Here is the podcast from our social media workshop. We have also included our slides, some notes and links to useful resources. We cover everything from the basics of twitter to RSS feeds, periscope, designing websites and building a log of all your social media activity for appraisals. We hope you enjoy! Go to Twitter.com and choose ‘sign up’. Provide your details. You will need to give either a valid phone number or email, in order to receive a confirmation code. It is safe to do so. It’s generally fine to give your real name, but you do not have to. The system will suggest a @username (Twitter handle) based on the details you give it; but these tend to be of the generic “@JohnDoe12458” type, and it is better to invent your own. Similarly, you don’t have to fill in your profile or photo right away, but it will help to distinguish you from the mass of other new users if you do. The sign-up process suggests a number of contacts to follow, based on your own contacts plus some sample “popular accounts”: it is OK to bypass this stage, which can clutter your feed. On a phone, Twitter can be accessed by web page or app. The interface is similar on each. The official app is convenient, and is worth downloading when prompted. “If you want to know how we practised medicine 5 years ago, read a textbook. If you want to know how we practised medicine 2 years ago, read a journal. If you want to know how we practise medicine now, go to a (good) conference. The growth of social media for medical CPD has been astronomical over recent years. More and more healthcare professionals are taking to Twitter to share useful papers and educational resources. The emphasis on encouraging Free Open Access Medical Education (FOAM) is embedded throughout these interactions. We have no intention of reinventing the wheel with this one, but have tried to combine the wealth of information already out there with a few of our own experiences. Hopefully this will help newcomers to Twitter, and perhaps persuade those still resisting to come on board. • Online social networking/microblogging platform enabling users to send and read text-based messages (‘tweets’). • Limited to 140 characters [see highlighted text below to see how long that is!]. • Photos can be tweeted. • You only read tweets of people you follow. • Anyone can follow you, although you can block them if you wish. • Global conversation with like-minded individuals interested in the latest medical practice and literature. • It’s acceptable just to watch if you prefer. • Follow conferences even if you are not there. • Social networking and friendships develop and can be consolidated at conferences, with colleagues across the globe. This means that you’ve chosen to subscribe to their Twitter updates. You can unfollow them at any time. Similarly, anyone is able to follow you. If you decide that you do not wish for them to do this, you can always ‘block’ them. You can easily see who is following you. Have a look at someone you know, who is already using Twitter for medical education purposes, and look at their list of people they are following. You will quickly learn to recognise the Twitter characters who are reliable and useful, and after a period of Twitter interaction, you should start building up your own following. What’s @ and # all about? @TwitterID directs your message to that person. You can add other names if you want to send to multiple, but beware the character limit. If ‘@’ appears at the start of the tweet it will go to that person AND anyone who is following both you and them. If ‘@’ appears later in the tweet, it will go to that person and ALL of your followers. To illustrate this, if you send the following tweet ‘@avkwong this blog is rubbish’ – I will receive this message and anyone that is following both of us. If you send ’This blog is rubbish @avkwong’ or ‘This blog by @avkwong is rubbish’ – I will receive this message and also ALL of your followers – thanks! A Direct Message (DM) This is a private message and visible only to you. # (hashtag) is used to mark keywords or topics in a tweet. Anyone can make a hashtag at any time, simply by typing a phrase of the form ‘#topic’ in a tweet (again no spaces). This creates a page specific to that hashtag and whenever someone tweets and includes this hashtag, it will be visible on this page as well as to anyone who follows them. Many hashtags have already been created, and medical conferences will advertise the ones they are using e.g. #isicem15 (International Symposium on Intensive Care and Emergency Medicine 2015), #ICSSOA2015 (State of the Art Meeting, ICS 2015) and #smaccDUB (Social Media and Critical Care Conference 2016). The days of writing notes at conferences (if you did in the first place) have also gone if the conference is well covered by avid Twitter users. Photos of conference slides, posters and equipment at trade exhibitions can also be tweeted and shared. What’s Twitter not so good for? Apart from your social life, it is not a great platform for having extensive discussion and debate. This often is difficult to fit in 140 characters, and results in huge number of tweets about one topic, and the context of these key messages can often be lost in translation. You should comply with the General Medical Council (UK)’s ‘Good Medical Practice’ (http://www.gmcuk.org/guidance/good_medical_practice.asp) or equivalent in your country, and it is worth having a look at the brief GMC regulations (http://www.gmc-uk.org/guidance/ethical_guidance/21186.asp). A few suggestions of who to follow to get you started…. Also, take a look at the list of individuals or organisations that someone else is following and pick out your favourites. Perhaps two of the most common ways of coming across podcasts would be via either the native podcast app on the iPhone or iPad, or via iTunes on a computer. The podcast app is now one of those apps that cannot be deleted from the device, so it should always be possible to find it. From here it is very easy to search and download the podcast to the device. iTunes can be accessed via the internet and then downloaded to the computer. You can organise your own library of music here as well as search the Apple store for music and podcasts. Most podcasts are accessible this way. How can you listen to them? I listen to most of my podcasts in my car and I have found one of the best ways of doing this is via Bluetooth with the car radio. If you don’t have a car radio with Bluetooth, it is not a very expensive upgrade to get one fitted. (Bluetooth Car Radios) I find this journey time now very valuable. How can I make a podcast? If you want to be more ambitious you could go ahead and make a podcast! Is it difficult? No. not really. Does it require a lot of expensive equipment? No, not if you already have a computer and access to the internet. You will need a microphone to plug into your computer. Most are USB microphones so once plugged in will self install. The prices will vary a lot from tens of pounds to hundreds. If you want good sound quality that is affordable then go for one of the Blue range. Some podcasters do not recommend these as the sound is not considered the best it could be, but I think for a low budget these are not a bad alternative. If you want one of the mics that is recommended by podcasters themselves then you should think about the Samson Q2U. This is a dynamic microphone which will cut out a lot of the background sound making the overall impression sound much more professional. When you have created your podcast you will need someone to host it- to store the sound files so that they can be linked to. I DO NOT RECOMMEND Soundcloud. They are reported to be struggling financially and I think they will not be with us much longer. I do recommend Libsyn. The starting costs are at about £3.50 per month and increase depending on how much you wish to store with them and the level of stats you want. I hope you will at least give listening to podcasts a go. There is a massive FREE resource out there for you to access. You will find ones you love and ones you don’t. Decide which ones you want and enjoy listening to them! 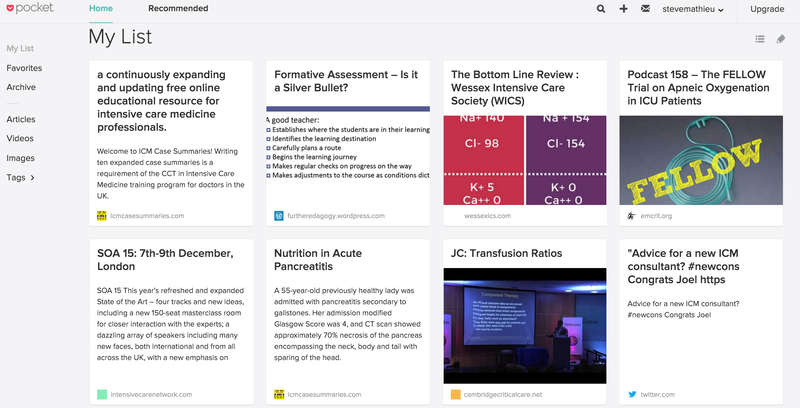 Primarily featuring Dr Scott Weingart, an ED Intensivist from New York, the philosophy is to bring the best evidence-based information from the fields of critical care, resuscitation and trauma and translate it for bedside use in the Emergency Department and the Intensive Care Unit. Scott is very passionate and explains his topic well. He will inspire you to greater things! This is the podcast of the Society of Critical Care Medicine in the USA. Rated very highly with some very experienced clinicians narrating various subjects. ICN has its beginnings in the Sydney Intensive Care Network, established in 2008 by Liz Steel (now Hickson) and Hergen Buscher. These bi-monthly meetings were to educate Sydney critical care trainees as well as give them a chance to meet and network, and see how things were done in other hospitals. Oli Flower & Matt Mac Partlin joined the team and started the ICN website with Daniel Steel. 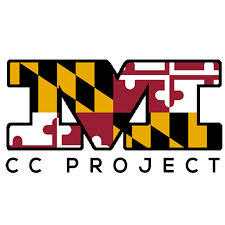 This is a podcast run by the University of Maryland Critical Care Fellows, helping them share the education they are receiving. Again, great quality content. NOT a medical podcast, but if you love a real life murder mystery then I cannot recommend this highly enough. This takes the case of a young American student who was allegedly murdered by her ex boyfriend….or was she? Do yourself a favour and go and listen to this….you will be gripped! There are a number of ways of recording the many hours you spend enjoying the new #FOAMed knowledge you acquire and share. With a few simple steps, you can be set up and then have this information readily available for your next appraisal. To create your story, you can select information from a variety of sources, including: Twitter, Facebook, Flickr, YouTube, Google, RSS. 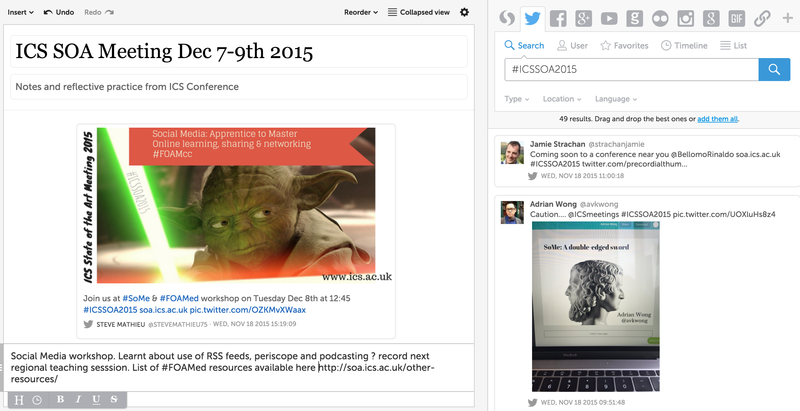 You can enter search terms such as a twitter hashtag for a conference (e.g. #ICSSOA2015) and use multiple filter options to limit the results displayed. Once you’ve collected information that you’re interested in, you can move the bits you want to include in your story by simply dragging from your search result list to your storyboard. To provide context, you can free text on the left margin of the storyboard to provide titles, commentary, or summaries. You can also add links here to associate your text with information from a wider range of sources. Storify allows you to automatically share a story to Twitter and/or Facebook and provides an embed code so that you can embed your story on a Web site. 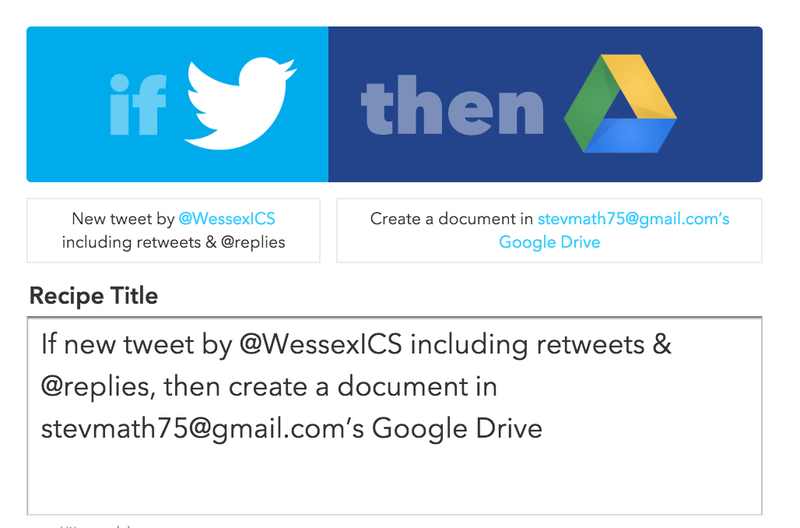 You can also share your Storify link with others. Pocket allows you save and store SoMe from many different platforms including Twitter, Flipboard and Feedly. Another feature is the ability to email yourself useful links. You can set this up easily on your pocket account and you then just need to email add@getpocket.com with the relevant link in the main body of the email. This will then automatically send the link to your pocket list. There is an option to purchase Premium package but free works for me! Here is an example of how your information is stored. It can also be presented in a list format which is easier if you wish to scan more material. You can create tags to help you search for articles and links more readily. The criteria set states that all my tweets (or RT or reply) will be saved. I then need to choose where it is saved and there a re a number of options here including dropbox, evernote, googledrive. I have chosen to use google drive to record my twitter activity. The recipes are very straightforward to set up but there are also plenty of ready made ones to choose from. Remember to turn off notifications when you set this up, otherwise you will get a message on your smartphone or iPad every time your recipe is triggered. If you have a website, then you should make sure that you keep a record of the interest generated from your website and posts. Blogging sites like wordpress come with this already set up. Google analytics is very useful if you are not using wordpress or your site does not have built in analytics. You do need to sign up for a google account and then set up google analytics but these are both free. State of the Art is nearly here. Take a look at the updated programme on the conference for the latest news on our exciting line-up. What else is new this year? We have put more emphasis on networking, interaction and after-hours social options. We would like State of the Art to be a unique chance to meet and exchange views with your UK colleagues, in a way that is harder to do at the big European meetings. Firstly, we want your input in the main sessions, and have taken steps to reduce the barriers to taking part. We have introduced floor microphones by request, and there will be an online moderator to take Twitter questions (we will show you how to set this up). Secondly, many of the sessions will be set up for combined panel debates with all the speakers, to give everyone in the audience time to warm up and take part, (instead of the usual ‘blink and you miss it’ Q&A after each talk) and so that the speakers can exchange and create new ideas with the delegates and each other. Thirdly, in the exhibit and poster halls, we have two podium stages for some ‘soapbox’ sessions – a mixture of main speakers, ad hoc debates, and even an ‘open mic’ slot for your own ICM-related topics, when you have something you want to get off your chest. How convincing can you be in 2 minutes? After hours, we now have evening receptions on both Monday and Tuesday (the latter sponsored by Aerogen), and the registration desk will remain open until 7pm on both evenings to give you advice, printed guides, and act as a meeting point for going out for the evening – whether in Docklands or in central London. A couple of the more gastronomic and fun-loving ICS council & committee members (yes, we have resurrected one or two) are writing a quick guide to recommended dining and entertainment areas – advice definitely to be taken at your own risk. Unfortunately we can’t put on a gala dinner without wiping out the ICS education budget for the year, but we will be interested to hear your networking and social ideas for 2016. These meetings should be as much about getting to know and learning from your colleagues as from the speakers, and we welcome your further suggestions. 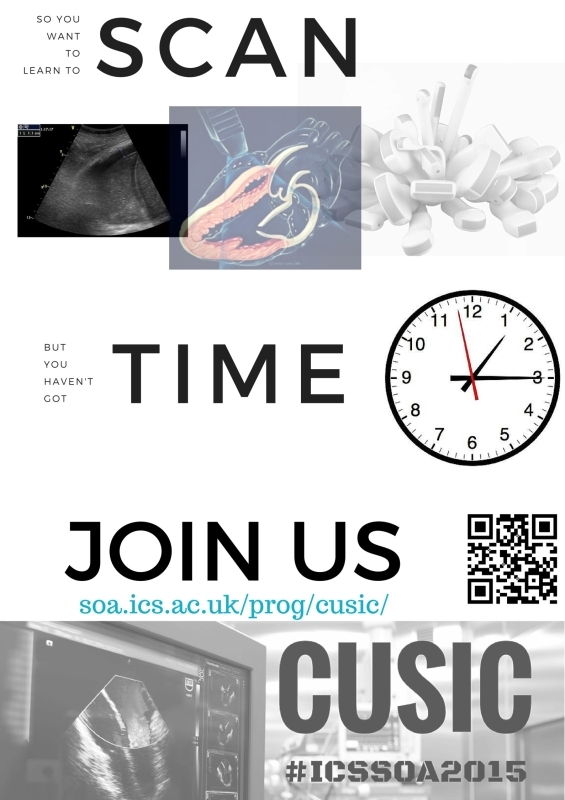 I just want to attend the CUSIC course…. This two day course designed for trainees and Consultants in Critical Care, Emergency Medicine and Anaesthesia. Multidisciplinary faculty including CUSIC council members. Interactive tutorials on basic scanning principles. Scanning practice in small groups with experienced mentors.Interactive simulators and problem based video scenarios sessions. The closing date for paper registration is 17:00 hours Friday 20th November 2015. Delegates wishing to register after the closing date should telephone the Office by 17:00 Friday 27th November 2015 to check availability or they may be turned away on the day. If there are available spaces, late registrants will be subject to a £10.00 surcharge to cover additional administration costs. The State of the Art Meeting this year is going to be packed with #FOAMed. We will be discussing ‘the good, the bad and the ugly’ of Social Media. We will also be hosting a workshop covering everything from Twitter, Periscope, WordPress, Blab, recording CPD and lots more! Get ready for daily blogs, interviews with the speakers and lots of open access material. We look forward to welcoming you in December! Too Pale, male, and stale? The title quote does not come, in this case, from the row over Jeremy Corbyn’s senior Shadow Cabinet appointments, although it did also crop up there. In fact, it’s a phrase I heard a couple of months ago from one of our own new speakers, when I asked her for her perceptions of State of the Art. Was she right? Well, your survey responses earlier this year also told us that we needed to change, so we have listened. The question is, have we succeeded? The “pale” part is a bit tricky to comment on without wading into ethnic profiling, though the faculty is certainly diverse this year. Gender is easier to quantify. With 22 female speakers and chairs, making up 27% of the total body, we may still have a long way to go, but the contributions are strong and varied: to list only a few, Charlotte Summers on mechanisms of ARDS, Judith Nelson from Memorial Sloan-Kettering on end of life decision-making where she is joined by Zoe Fritz, and on ‘humanising the ICU’ with Dorothy Wade; Anna Batchelor chairing the social media and critical care sessions and Julia Wendon on bleeding in liver disease; while Claudia Dos Santos from Toronto appears in the opening sepsis plenary as well as the ‘science of muscle wasting’ and ‘chronic critical illness’ sessions. Ella Segaran has organised and is chairing all three of the rehab and recovery-themed sessions, with the early mobilisation session including Fiona Moffat from Nottingham and Carole Hodgson of ANZICS, who is also performing a breakfast annual review on mechanical ventilation. Sarah Cunningham-Burley will discuss the ethics of big data in critical care, while Carole Boulanger and Sarah Quinton will give insights into outreach and setting up critical care practitioner teams, and we are lucky to have Nuala Lucas, Audrey Quinn, Fionnula McAuliffe, and Bronnach Pemberton speaking on maternity critical care, via the good offices of the OAA. Meanwhile, we’ve been having some fun with the formats, so Niamh Feely will have what I suspect will be a lively debate on in-situ SIM vs. SIM centre models with Mark Forrest and Matt Williams, while Susanna Price will spar with Antoine Vieillard-Baron on the pros and cons of intensivist-delivered bedside echo. We’ve given the never-stale Luciano Gattinoni his own masterclass to review a working lifetime in ARDS; but unlike any other conference that he’s been in, we’ve paired him up in dialogue with Charlotte Summers to keep him on his toes: one of the grandest names in ARDS, put through his paces by one of the brightest next-generation stars. This year the the UK’s national critical care meeting is going to be different. Bigger, brighter, and generally just shinier for 2015. But why you should come as a trainee? Because we‘ve designed this meeting for you (don’t tell the consultants). We’ve planned it with substantial input from the ICS Trainee Committee, as well as from major UK social media/FOAM contributors and organisers including Rob Mac Sweeney of Critical Care Reviews, Steve Mathieu of The Bottom Line and Veerappan of Critical Care Symposium; together with support and advice from the SMACC team (many of the State of the Art organisers will be in Chicago in June). To really make your mark on this conference, apply and present in our trainee competition, with two chances to be selected to give an oral presentation at the SOA – a national conference. See the cauldron page for more details. Submission is now open! We want the meeting to be more interactive than the average conference: so join in, chip in to the panel debates, use the conference app to Tweet your questions, meet the speakers for coffee or wine afterwards, and try (if you can) to dodge the pop-up flash debates in the exhibition hall. SOA is evolving and it’s an ongoing process, so take part in the delegate survey and give us your own views about what you see: https://www.surveymonkey.com/s/ICSSOA2015. Or feel free to email the programme organiser directly: ganesh.suntharalingam@nhs.net. If we use your idea, whether in 2015, 2016 or 2017, we’ll put your name on it! And you may win a free 3-day pass. State of the Art, Dec 7th-9th Dec 2015. Mark your diary, check your rotation, and book your study leave: and think about your abstract and cauldron submission (deadline Aug 6th – get it in before you rotate). Early bird registration closes Sept 28th. State of the Art 2015: Time for a New Approach? As Tennyson (almost) said: in the Spring, a young(ish) man’s fancy lightly turns to thoughts of … State of the Art 2015. It’s the biggest event in the ICS calendar, and the largest meeting of critical care professionals in the UK.